NYCT officials also said that the F Train will not be getting express service until at least 2012, when the Culver Viaduct rehabilitation will be complete. The severely deteriorated Culver Viaduct is the short elevated stretch that carries the otherwise-underground F and G trains over the Gowanus Canal. The G train will be permanently extended to Church Avenue and the dour Fourth Avenue station will get a complete overhaul as part of the Metropolitan Transportation Authority’s $250-million repair of elevated portion of the tracks between Carroll Gardens and Park Slope. 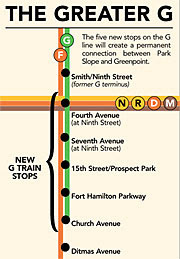 To begin with, the G train, which runs along the same tracks as the F between Bergen Street and Smith-Ninth Street, will be permanently extended to Church Avenue. Originally, the MTA said the line would add stops at Fourth Avenue, Seventh Avenue, 15th Street, Fort Hamilton Parkway and Church Avenue only until the repair work to the viaduct was completed in 2012. But now the agency says that the direct underground link between Greenpoint and Kensington — by way of Park Slope —will be permanent.